“The intelligent investor is a realist who sells to optimists and buys from pessimists.” ~ Benjamin Graham, Jason Zweig in The Intelligent Investor, Rev. Ed. Editor: Great advice! Now, how do we act on it? See the articles below and view the short videos at the end of this post. Look who bought Facebook:http://www.youtube.com/watch?v=wPvF97_q00s&feature=related OUCH! Please, no small children should see this video. As a psychiatrist I’ve born witness to many extremes of mood. I’ve tried to steer manic venture capitalists away from spending their life savings on cocaine and sports cars. And on the other extreme I’ve born witness to the deep pessimism and despair of suicidal clients, trying to help them choose life over oblivion. My efforts are not always successful, and I’ve learned a lot about the limits of rationality when faced with extremes of mania and despair. At both extremes many of the people I’ve worked with are highly intelligent and believe they are acting with perfect rationality. Yet despite their innate intelligence, deeper emotions occasionally sweep away their anchor to reality. In Ben Graham’s quote above, one could be mistaken for thinking of the “intelligent investor” as a robot or algorithm. Human investors feel the extreme optimism and pessimism of the markets. And the effect of this optimism and pessimism is, almost universally, to bias their interpretations of real events. While the best investors feel the moods of the market (that is, they are empathic), they also have the almost super-human ability to act contrary to their emotional biases. Graham’s vision of intelligence in the 1950s is what we today call emotional intelligence. Warren Buffett called Graham’s book, The Intelligent Investor, “By far the best book on investing ever written.” I think it’s worth looking for lessons in Graham’s thoughts on optimism. Today’s letter will examine the nature of optimism in the financial markets: How we experience it, how it distorts our investing, how it plays out in markets, and how we can succeed while being both optimistic AND realistic. As we go through these themes, we will look at French and Dutch optimism in the Euro-zone, the delusional optimism at the launch of the Facebook IPO (see Dr. Murtha’s hilarious Part 2 video), how portfolio managers can use optimism to their advantage, and visit some tools and techniques for making ourselves better investors. It has been a sport in the media to level snarky criticism at the Facebook IPO. But if you’re a long-term investor you might appreciate that not every stock goes up. The IPO went reasonably well given its huge dollar size, massive trading volumes, and the usual banker conflicts-of-interest.What is most concerning to me is why anyone wanted to buy into the IPO, much less overvalued Facebook stock, especially after the shares were sold publicly. Apparently the marketers did their job well, and some of the uninformed investing public took an optimistic gamble.While most Facebook IPO investors had a “rationale” based on some sort of personal logic for their investment, we offer the following – the brain will make up a good ationale to justify us doing what we really feel inclined to do for EMOTIONAL reasons (i.e., Graham’s optimism). Who bought Facebook shares? Probably those who were excited, optimistic, and caught up in the hype. Trouble was, there were a lot of those people (MorganStanley didn’t get so big by products alone – marketing is key). Dr. Murtha created a humorous follow-up video to his popular first-take on the Facebook IPO. Part 1 showed what financial advisors are up against when talking to optimistic (and under-informed) clients. Part 2demonstrates the mind-bending effects of what we call “toxic optimism” or what the layman might call “sheer AWESOMENESS” as a client ponders Facebook stock.Please take a look at Part 2 and let us know what you think. The above study implies that Graham was correct, the emotional component adds value to understanding fundamental valuations. Value strategies can be improved by adding psychological data on optimism and pessimism.We seem the same delayed effect in places such as Burma. There are more horse-carts than cars in Burma. There are loads of natural resources. There is huge potential for growth there, so no wonder investors are optimistic. And they should be. Over the long term the country will likely do very well and buying optimism may be short-term painful, but long-term rewarding in a place like Burma. The human problem with investing is that our perspective changes in reaction to the markets. Our moods shift as prices shift. Our time horizon lengthens or contracts based on our blood levels of stress hormones. Monday the markets are up and we are analytical long-term investors. On Tuesday Greece defaults, the S&P500 dives 7%, and we become traders.We’ve tested over 20,000 people in our free online personality testssince 2004. 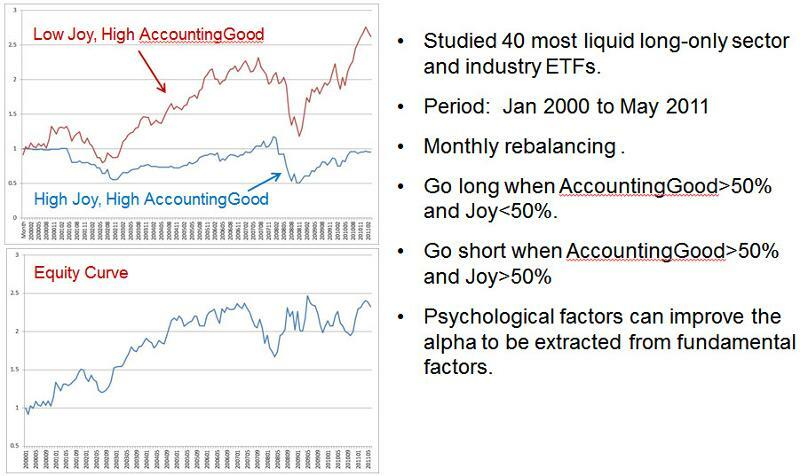 We’ve found some key indicators of overconfidence that correlate with lower reported investment and trading returns. Please take a personality test if you haven’t already before reading these results. EXTROVERTSPeople who are more Extroverted (outgoing, gregarious, and optimistic) are more likely to have lower overall investment and trading returns. This result is true in all three of our personality tests – businesspeople, investors, and traders – all report lower long-term returns in their line of business if they are extraverted. In one studyextroverts were more likely to gravitate towards short-term investing, thus increasing their risk of loss.MEN VS. WOMENThe last question on our personality tests asks: Comparing myself to other investors, I think my abilities place me: (users answer in ranges: “Among the top 5 percent”, “Among the top 10 percent“, etc…). We found that this question seems to speak to men’s pride, and women’s sense of humility. On average men rate themselves as better investors than women do. Yet men’s actual reported returns are significantly lower than those of women. This disconnect between men’s returns and self-perceptions is most significant in relation to risk. Men suffer significantly greater lifetime drawdowns than women. Men have more trouble resisting the temptation of a “sure thing.” Yet sometimes men actually find a sure thing. In those cases, men are more likely to sell out too soon – they have a shorter attention span when it comes to investing, perhaps because they take too much risk due to testosterone effects on risk-taking, and they are more easily shaken out by volatility.Short of taking a personality test, how do we know if our own optimism is excessive? – Overoptimistic people do not look for contrary facts, due to the point above. – Overoptimistic people have no plan. What if volatility increases? What if the price drops 2% tomorrow? No contingencies are considered (again, see point 1 above). How do we get out of the over-optimism habit? – Use a system that requires you to check the potential downsides. Force yourself to look at objectively contrary information. – Use only objective criteria that are relevant. “Facebook is the third largest country in the world.” Is an interesting “fact”, but it is not relevant (nor is it accurate, obviously). To remain analytical, consider facts such as, Facebook has 955m users. Then figure the revenue from each. Then look at the growth rate of revenue. Those are facts. How many users does Facebook need to have, at the same servicing cost, for its P/E ratio to be 15 (that of Apple)? About 5 billion? How many people live on earth, again? Hmmm…. While most of this letter has been about the troubling effects of social and investor optimism, recall that individual optimism is a good thing – it stimulates resilience and can help us stay active and engaged. Furthermore, optimism can help us to see opoportunties when all around us are despairing and pessimistic. For investors, optimism is most critical to maintain when the world around appears to be falling apart. Positive psychologists have found strong empirical evidence for several simple exercises to build our mental habits of optimism. Successful investors need to develop a placebo habit (seeing the opportunities) when others are pessimistic and a nocebo habit (seeing the dangers) when others are optimistic. Just as our mouths emit an unpleasant if we don’t brush our teeth every day, so too will our attitudes become noxious without ritual cleansing. Some people use prayer, others use morning routines to get in the right headspace. Below are two exercises to help you quickly get your noggin screwed on straight. Practicing these once per day takes 2-3 minutes and improves quality of life dramatically, according to research. 1) Visualize your best possible self. Imagine yourself in your work in a state of peak performance. Next see yourself in at least one scenario involving achievement (e.g., executing an excellent investment) and one dealing with challenges (e.g., problems in an investment). Take on the peak performance attributes and imagine how you achieve. Then imagine how you work through the challenge. Close your eyes and visualize yourself with your peak performance characteristics for thirty seconds before reading on. 2) Create a gratitude list. Every day write three things you feel grateful for to a list. Each item should be unique. The simple act of thinking of three things you feel grateful for strengthens your sense of solidity and groundedness. Moving forward in your day, you are likely to think more creatively and proactively and with less vulnerability. We have much more about these exercises in our books and training workbooks – please email if you’d like more information or to share experiences. Now let’s turn to one of our prior predictions, one we’re not happy about. Do not panic if you see folders change or disappear—when finished an email will go out to everyone that has sked for a key.